This week in the war, at midnight on the night of 30/31 May 1942, Churchill announced to his dinner guests at Chequers that the RAF was, at that very moment, striking Cologne with over a thousand bombers. The guests included such high-profile Americans as presidential advisor Averell Harriman, US ambassador John Winant, and General Dwight D. Eisenhower. At that stage of the war, the USA had only a handful of men in Britain, and no planes at all. The central point, for aiming purposes, was Cologne’s famous twin-spired cathedral (shown in the picture to the left). 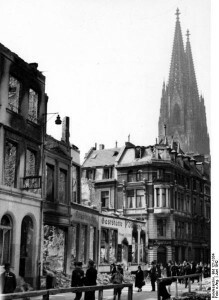 The cathedral was hit but survived the raid and was still standing when the war in Europe ended. Over 460 people were killed in the raid, almost entirely civilians, and more than 45,000 people were rendered homeless. Cologne had been chosen because the weather over Hamburg had been bad for several days. Hamburg’s time would come later. 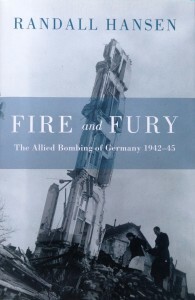 The Cologne raid, and the even more devastating raids on Hamburg and on Dresden, and the Allied bombing campaign as a whole are described by Canadian historian Randall Hansen in his vivid and well-written book Fire and Fury: The Allied Bombing of Germany 1942-45 (Doubleday Canada, 2008). German prestige had already suffered a severe blow earlier that same week when two Czechoslovak patriots had attacked and fatally wounded Reinhard Heydrich, the Reichsprotektor of Bohemia & Moravia. This entry was posted in Book, World War II and tagged Averell Harriman, Cologne, Eisenhower, Hermann Goering, Heydrich, John Winant, thousand bomber raid. Bookmark the permalink.